This page is about the Soviet light tank BMP-2. For the version equipped with a 73 mm cannon, see BMP-1. The BMP-2 is a Rank VI Soviet light tank with a battle rating of 8.0 (AB/RB/SB). It was introduced in Update 1.81 "The Valkyries". BMP-2, just like the predecessor, has spaced armour, module placement and low profile as key defensive features. Just like before, it's very hard to hit BMP when only turret is pulled outside of cover. If an enemy attacks from the front or rear, it can hit the one of the many modules (radiators, engine, even the log) instead of the crew. Hitting engine and radiators with ATGM does not cause hull break. Additional armour can be installed, allowing BMP-2 to resist 12.7 mm machine guns, but making it unable to swim. Mobility is decent for a light tank, top speed forward being 72/65 km/h (AB\RB), but it can only drive backwards with speed of about 10 km/h. BMP-2 can swim with speed of about 7 km/h, but only without additional armour. The Shipunov 2A42 30 mm Autocannon is a very effective weapon not only for tanks but for planes and helicopters too. Its reload rate for the belts is quite fast at 1.15 seconds and it gets a choice of HE, APT, and APDS. 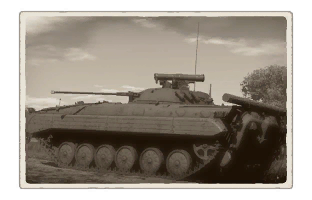 The APDS belts have enough penetration to obliterate lighter tanks such as Leopard A1A1s, AMX-30B2 BRENUS and Warrior frontally, however, when engaging other larger targets it's only possible to completely defeat them from the side, though you can still cripple enemy tanks frontally by shooting cannon barrels and breaches. When necessary, 2A42 also serves as a very effective Anti-Aircraft gun, as its 30mm shells shred apart helicopters and planes alike and with vertical guidance of +74 degrees, this is a very versatile weapon system. The main concern with this powerful main weapon is the ammo capacity. Gun has two firing modes - relatively slow (~200/minute) and extremely fast (~550/minute), while your ammo capacity is 500. To not run out of ammo during battle, one should use full auto mode only when facing certain doom, or sitting in ambush position against unknown enemy. BMP-2 also has ATGM launcher. It's guidance system is semi-automatic, so it's easier to use in RB, and you don't have to research it. The ATGM is able to penetrate most tanks BMP-2 can meet at it's BR, and you can use them at long ranges. However, you only have 4 of them. Use them wisely. 7.62 mm PKT is only used by BMP-2, when it wants to destroy some small fence in it's way, since it makes less noise. Alternatively, it can be used to mark or annoy enemy in Realistic battle. Using it for anything else is pointless, since the main gun does everything better. The arrival of the BMP-1 infantry combat vehicle in the Soviet Army greatly increased the firepower and mobility of infantry formations on the battlefield. However, there were also significant shortcomings, mainly in the armament department. The 73 mm Grom gun, which was installed on the BMP-1 wasn't particularly efficient against infantry units, tanks and low flying air targets. In addition to this, the flight of the trajectory became impossible to predict if even a small crosswind was present. To account for these issues, a decision was made to create a new vehicle based on the BMP-1 with the automatic rifled gun. Among the several projects carried out, the vehicle designed by Kurganmashzavod engineers was acknowledged to be superior to the rest. The BMP-2, which was put into service in 1977, had a similar design to the BMP-1 in terms of the layout and general configuration. However, the turret underwent significant changes. It now had space for two crew members – the gunner and the commander, and the automatic 30 mm 2A42 gun became its primary armament. Just like its predecessor, the BMP-2 was fitted with a launcher capable of firing either the Konkurs or Fagot anti-tank guided missiles, which the vehicle could deploy when engaging tank units. The vehicle was regarded as fairly successful, and over the years of its service, the BMP-2 underwent a series of modernizations and modifications directed at improving the vehicle’s defences and increasing its destructive capability. The BMP-2 remains in service till now and is in great demand abroad. 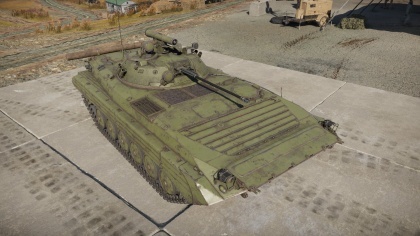 Skins and camouflages for the BMP-2 from live.warthunder.com. This page was last edited on 16 April 2019, at 20:48.